I’m excited to be speaking at two events in London in June. On June 2, I’ll be speaking at a conference on democracy and dissent in China and India called “Resistance and Accommodation in Tibet and Kashmir” with an intimidatingly impressive list of guest speakers including Arundhati Roy and Wang Lixiong. The conference is organised by Dr. Dibyesh Anand, University of Westminster, London. My panel will specifically be on Tibet, see the whole programme on the conference site. Sadly Tenzin Tsundue won’t be joining after all but he will be replaced with another speaker. Then as part of “Tibetan Fortnight” at University College London, I’ll be giving a talk on June 8 titled “The Virtual Sweet Tea House: Tibetan Voices in Cyberspace”. The programme for the fortnight looks great and it will be kind of weird to be speaking at UCL, which is where I did my undergraduate studies! See the whole programme on the UCLU European Society Website. Hope to see some of you at either or both events! After last week’s Shapale excitement, I’m going to write about a music video that is most definitely not banned in China, in fact quite the opposite. It’s the music video called “The Call” and it’s for a new animated feature film “Tibetan Mastiff Dorje”, set for cinema release in China this year on June 28. The singer is Alan Dawa Dolma. 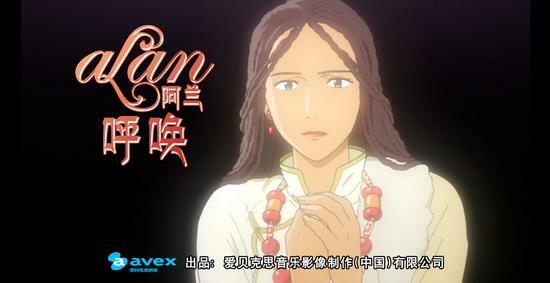 According to Chinese state media, “Tibet Mastiff Dorje” is the debut cooperation film between China and Japan on animation, which explains why Alan Dawa Dolma is singing the theme song. For those of you down with contemporary Tibetan pop culture, you’ll know that Dartsedo born Alan Dawa Dolma is a bit of a pop sensation in Japan. She is also properly famous, having done the theme songs for John Woo’s two episode film “Red Cliff” back in 2008. If anyone can explain why she calls herself Alan though, I’d be interested in knowing that! “Tibetan Mastiff Dorje” is adapted from a best-selling novel, which described the story of Tian Jin, a ten-year-old boy and a mastiff he saved on the plateau in southwest China’s Tibet. Given the huge appetite nouveau riche Chinese people seem to have for Tibetan mastiffs, both in real life and in cultural matters related to Tibet, it makes sense for a major animation film to feature a Tibetan mastiff! Hardly a month seems to go by without some kind of headline describing how a rich Chinese business person paid an obscene amount of money for a Tibetan mastiff, they are really obsessed with mastiffs as a status symbol. I think the most recent news story was last month, a Chinese coal baron paid $1.5 million for a Red Tibetan Mastiff. 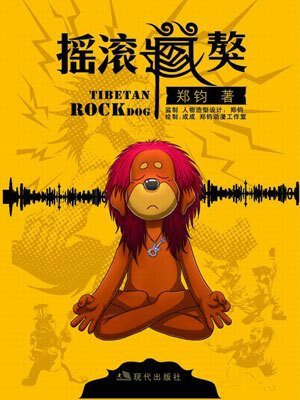 My personal favourite Tibetan mastiff cultural treat is the two-part 2009 graphic novel called “Tibetan Rock Dog” written by a Chinese rock star called Zheng Jun who had a huge hit in the 1980s with a song called “Return to Lhasa”. The story is about a Tibetan mastiff called Metal who grows up in a monastery in Tibet and is then taken off to Beijing by a “Tibet Drifter” type rocker where he forms a rock band! All pretty silly stuff but I find it quite cute and it also leads me nicely into the next thing I want to take a closer look at – FONTS! 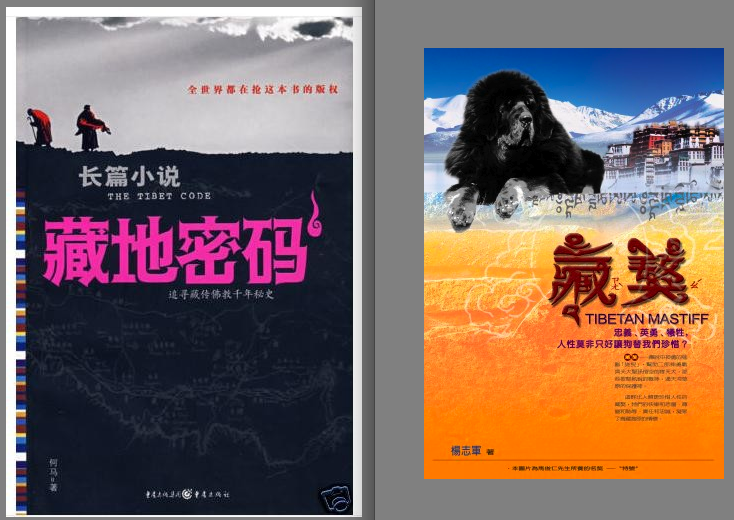 Take another look at the fonts on the book covers above, “Tibetan Mastiff” and “Tibetan Rock Dog” are good examples of the Chinese font that is trying to look like Tibetan script! There is a term in typography for one style of writing trying to imitate the stereotypical letter forms of another language: simulation fonts. Here is a link to a font called Al-Andalus, an Arabic simulation font. The only thing I have found written specifically about Chinese and Tibetan is this 2007 post from Danwei.Org, they call it Tibetan-style Chinese. It’s widespread in the PRC and you can see it from book covers to food packaging to album covers, basically for anything packaged as “Tibetan”. This brings me back to the Alan Dawa Dolma video as it’s the first time that I have seen an entire music video subtitled in this font. The font is fascinating, as is her singing in Chinese, Tibetan and English. Alan Dawa Dolma fan forums also suggest that there is a Japanese version of the song somewhere. The mastiff, the singer, the music and the simulation fonts are all connected – they all exoticise Tibet and Tibetans. From being amused by the things I have mentioned above, I am going to move to a more scholarly interpretation… The traditional Chinese image of Tibet is of wild and cultureless natives so this exoticisation in a way neutralises and pacifies Tibetans. Even the font turns Tibetan script into nothing more than a novelty. This is also a way in which uncomfortable politics can be evaded. The backward natives have now been turned into exotic natives – could this be the taming of Tibet! ?